Rachel (of Shoes & Sewing) sent me this fabulous look for less recently. It's such a dead ringer! What do you think? Is this something you would wear? Leave your thoughts below. These are great. Love the yellow. I love that skirt! And I love how you hunt for deals. Its super duper helpful. Thanks for the hard work you are doing on this blog. Its awesome. Yes I would wear that. 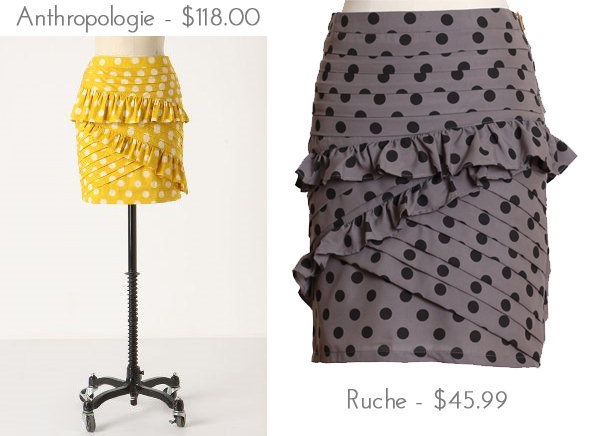 I love this skirt, but I don't think that this look would look good on my figure. Absolutely! I'm not really one for skirts, but this is just too cute to pass up. I LOVE both of those skirts!! I'd totally wear that, although it might be a tad short. Oh man, so many cute skirts out there that are just a hair too short! Found your blog today.. totally love it.. I am such a yellow fan but I look horrible in it, totally washes me out. I love both skirts so much! I love the texture. ohhhh just found your blog and I love it! Now following!